Dream of living in a log cabin? Try out this 16 by 20 cozy log cabin without commitment. Dreaming of living in a log house or owning a log cabin is one thing, but purchasing or building a log house is an entirely new world to venture into. Log home building, while an amazing process, can be quite stressful and, of course, quite expensive. Just like any home building process log home building comes with its ups and downs, so it’s best to be prepared for the process, so you’re aware of everything that goes into building one of these beautiful homes. Another great idea is to rent out a log house or cabin for a weekend or a couple of weeks, maybe even longer to see what log home living is really like. You can see how wonderful it feels to wake up inside of a cozy log house every morning, and how nice it is to breathe the fresh air. You may find yourself never wanting to leave, which would be a good sign and would signify that you’re ready to make a log house your home sweet home. Even if you’re not ready to purchase your own log cabin or home, it’s extremely refreshing to stay in one for a vacation from time to time without the commitment of owning one, which can be expensive. Why is log home building so expensive in the first place? Well, the materials used in the log cabin designs are quite expensive on their own, and as we all know, wood isn’t cheap because it’s valuable. Wood is, however also one of the more durable materials that are used in home building, and it’s the man-made home building products that seem to deteriorate faster than the natural materials. Think of how strong a tree is in the forest it grows and lives in. Trees can withstand a lot of forceful winds and some of the coldest temperatures. Some of the highest winds can’t bring these trees to the ground which shows just how solid they are. That same tenacity can be utilized in the building process, making strong, beautiful homes that can stand up to anything mother nature brings on. Log houses have shown to be able to stand up to hurricane winds which can reach speeds of up to 100 kilometres per hour, isn’t that incredible? Each log that makes up a log house contributes to the overall strength and durability of the home so each log must be engineered perfectly to be able to withstand the elements and the overall load of the home. The trees we use for log home building projects, these days must also come from sustainable tree plantations which are monitored and supervised for quality assurance, which means employing more people and that means raising the price of the materials supplied. You are paying for the labour as well as the amazing quality of the wood, which will last a lifetime if taken care of properly. If you are seriously interested in purchasing a log house or building one yourself, this type of smaller cabin would be a great place to start, and then it can always be built onto in the future. 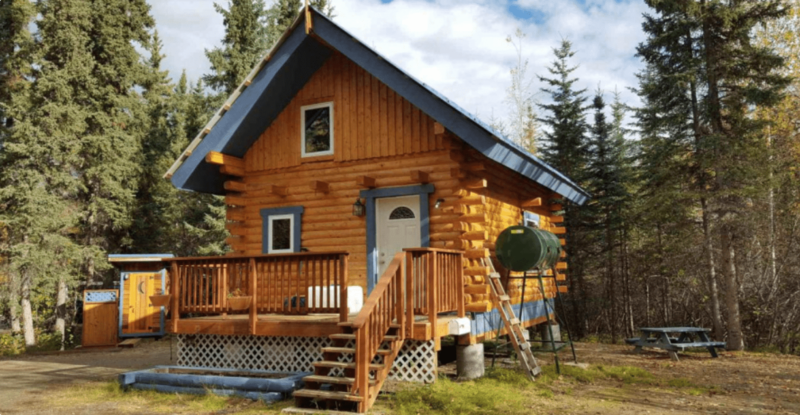 This particular log cabin is 16 feet by 20 feet with running water and is located in Goldstream Valley close to the University of Alaska Fairbanks. It has a nice large loft and a great living space. All of the log joints are caulked and insulated, the floors and roof are also insulated with high density closed cell spray foam insulation which makes a home very energy efficient. To heat the cabin, there is an oil heater that is very efficient and because the cabin is insulated so well, the entire space stays nice and warm in colder months. All of the windows are also triple-pane Low E, argon-filled windows and the front door is an insulated door.